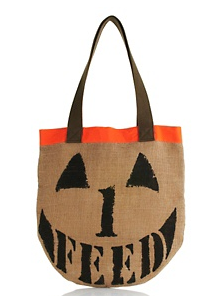 Check out the new FEED Trick-or-Treat bag to benefit UNICEF designed by Lauren Bush! Sure, unless you have kids you probably don't trick or treat anymore, but it's a cute tote bag for a great cause! For every purchase of this $13 limited-edition bag through HSN, a $3.50 donation will be made to help support UNICEF’s nutrition programs for children in need. That’s enough to provide one child in the developing world with a year’s supply of micronutrient powders! !